Neoplasia literally means new growth. The term neoplasm is used synonymously with the word tumour. However, a variant interpretation is that because a tumour forms a mass, while all tumours are neoplasms, not all neoplasms necessarily form tumours (one example would be leukaemia). Many of the aspects of neoplasia are discussed in their own separate sections. The links are as follows. Neoplasia occurs when the normal processes that regulate cell division are disrupted and become unregulated. The normal process of cell division is called mitosis. During mitosis a cell duplicates all of its chromosomes and separates the duplicates from the original chromosomes to yield two nuclei. The cell then divides into two daughter cells, each of which is diploid and has a nucleus which contains a copy of the chromosomes of the parent cell. Mitosis is the act of a cell dividing into two and centres around reallocating the duplicated chromosomes into two new nuclei. It is part of an overall process known as the cell cycle. The cell cycle encompasses not only the physical division of the duplicated chromosomes into two new cells but the processes that govern the duplication of the chromosomes in the first place. Many aspects of tumour biology relate to disruption of the control of the cell cycle. The cell cycle has several phases. In the G0 phase, the cell is actually resting and is not dividing. In the G1 phase of the cell cycle the cell is gearing itself up to divide. The size of the cell increases to ensure that it has sufficient cytoplasm and organelles to allocate to the two daughter cells it will become. However, the cell's DNA is not replicated at this stage.
' The S phase succeeds the G1 phase. During the S phase the cell is replicating its DNA. Following the S phase the cell enters the G2 phase. At this juncture the cell undertakes additional protein synthesis, mainly those connected with providing the machinery (in the form of microtubules) which will separate the cell into two. The G2 phase also provides an opportunity for processes to take place to ensure that the cell is in a fit state to divide and allows mechanisms to be activated to halt the division if necessary. The G1 phase, S phase and G2 phase are collectively known as interphase. If the criteria for progression beyond the G2 phase are satisfied, the cell will initiate the act of mitosis itself. This is called M phase. Entry of the cell into the cell cycle and the progression of the cell through the cell cycle is tightly regulated. 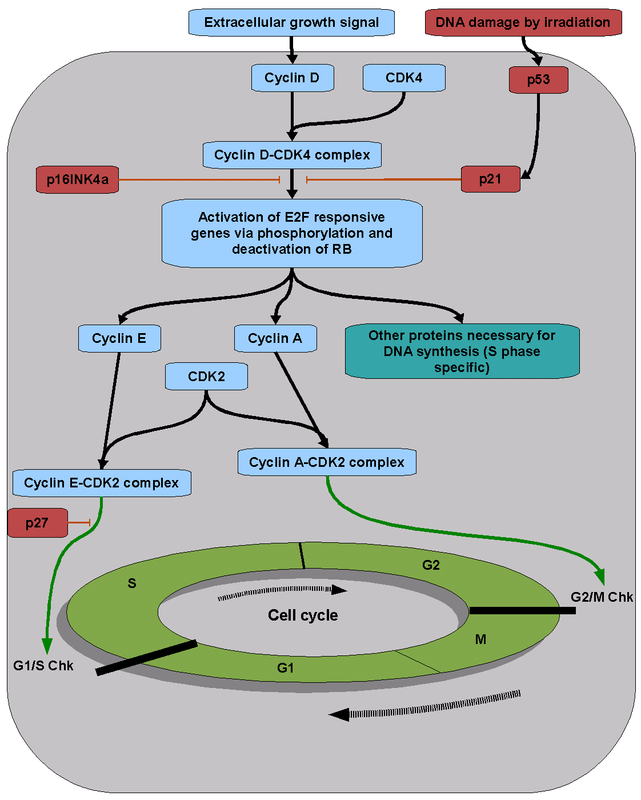 Some of this control and regulation is provided by cyclins and cyclin dependent kinases. The cyclin proteins are expressed at different stages of the cell cycle. They activate specific cyclin dependent kinases. Once activated a cyclin dependent kinase can phosphorylate serine and/or threonine residues on its target protein in order to modify the function of that protein. This modification of function is essential to allow the cell cycle to continue. The genes that govern entry into the cell cycle only become activated in response to appropriate signals. These signals include transcription factors which bind to the promoter regions of genes that encode the protein apparatus required for the cells cycle. These genes are only expressed in the promoter is bound. As well as agents that drive the cell into cycle, the regulation of cell division also includes factors that actively oppose initiation of the cell cycle and act as brakes on it. These include the retinoblastoma gene protein and the versatile p53 protein.